This gear was returned in great condition, with only minor signs of use, such as slight scuffs or pick marks. It looks and plays like new and may be considered an equivalent to display units found in retail stores. (Open Box) This bass powerhouse is back from its California vacation, and is ready to rock. This Eden World Tour Pro 900W head is fresh from Marshall's NAMM 2019 booth in Anaheim, Calif., where it was used to demo the hottest Marshall and Eden gear. Here's your chance to own a gig-ready piece of history. The Eden World Tour Pro 900 offers more power than its predecessor, and its updated cooling design ensures that not only does this amplifier offers more power onstage but it keeps cool during use, reducing servicing requirements. All of the World Tour Pro products utilise two tubes in the preamp stage. This provides the ability to add tube warmth to your sound in a way that enhances your tone and increases the flexibility of the amplifier. Every World Tour Pro amplifier retains the traditional Eden Hi Fidelity preamp sound but now you can chose to add in something more if required. Eden has developed new features such as an interactive mute indicator and a flexible studio quality compressor with amount and ratio controls and 3-stage compression indication, incorporating key elements of important outboard equipment into your rig. 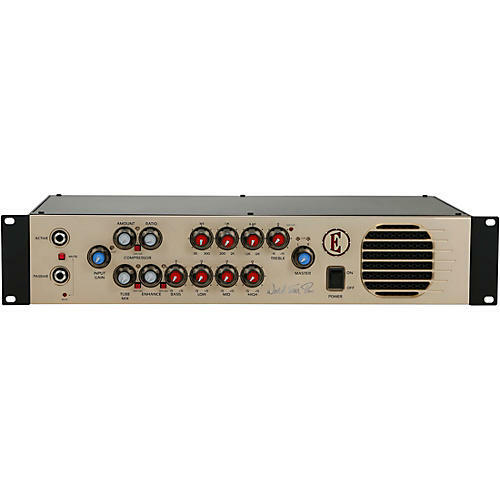 In addition, enhance, compression, tube and mute features can also be controlled by a stomp ware foot controller (sold separately) which indicates the mute state and compression state of the amplifier on the controller. This World Tour Pro 900W amp is also stunning to look at. Brand new Eden designed knobs with tactile rubberised feel material, chrome finish pips and color coding provides easy reference for your settings. The front panel has been designed to offer an uncluttered, easy-to-use interface. The World Tour Pro 900 utilizes 2 tubes in the preamp stage. As the Tube mix knob is turned clockwise additional Gain stages add extra tube warmth to your tone. Studio quality, high speed, soft knee compression. The compressor not only acts quickly but it also adjusts its compression dependent on where in the register notes are played. The World Tour Pro 900 is equipped with three heat-sensing fans that keep the amplifier cool even under the most extreme playing conditions. Dimensions: 3.5 in. x 16.9 in. x 15.75 in.